By Xah Lee. Date: 2015-12-08 . Last updated: 2018-02-05 . It's roughly a phonetic system. You press chords (multiple keys together) to enter a word. Left hand types the initial consonant, right hand the ending consonant. Thumbs for vowels. All at the same time. 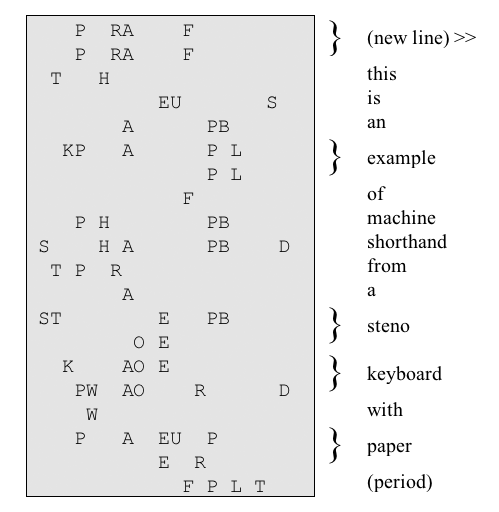 Steno shorthand transcript. Left side is what you type. This person, gives a demo of a PC keyboard steno system. Alternative Shorthand System for Computer Keyboard? It's a phonetic system. You type syllables, instead of letters. You press multiple keys at the same time, as piano chords. 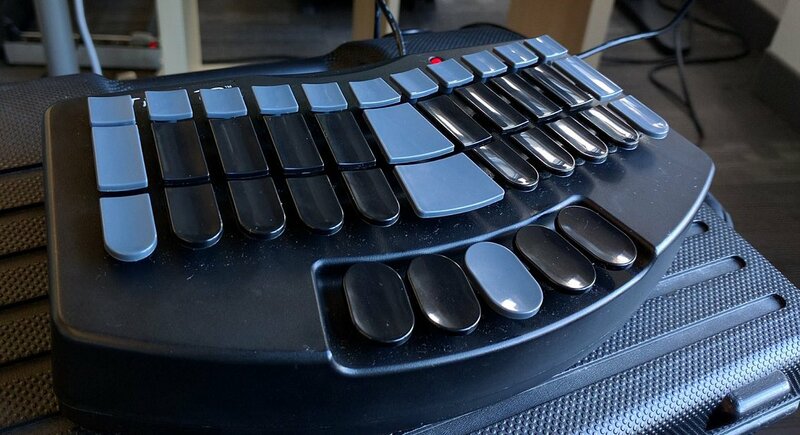 The physical keyboard is designed for chords. Also note, in English the language, word's pronunciation does not have a exact correspondence with how it is spelled. This is called the Alphabetic principle. So, this makes a phonetic input system more difficult to learn. But still, it's still faster and easier than entering each letters directly. 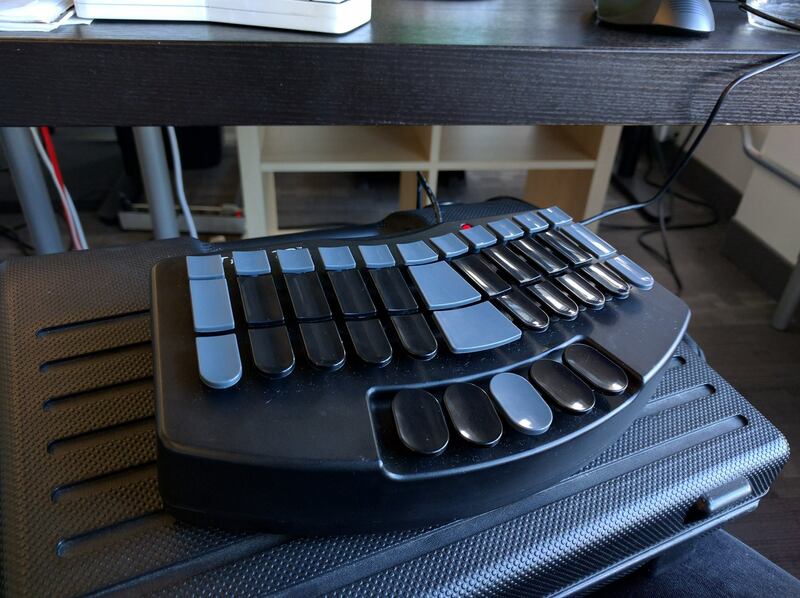 The chord keyboard (designed for pressing multiple keys at the same time) of the steno machine, is also much advantageous. At first, i wasn't sure about that. Let's say we have to press 3 keys on steno keyboard vs the normal computer keyboard. On the steno keyboard, the order doesn't matter. Can be pressed simultaneously. This is faster than pressing each key one by one. The speed difference becomes huge if you need to press more keys. Say, 3 keys for left hand, 2 for right. Doing that one by one, becomes a snail crawl. Then, i thought that chorded keyboard is unnatural. Not so, if you look at piano, flute, or guitar. All require using multiple digits in precise sequence of chord fingers. But again, you trade speed with learning curve. Then, i was thinking, how the steno keyboard compares to piano keyboard. The question here is, if we think of designing a hardware from the ground up, for inputting arbitrary text (natural language or computer code), then, what would it look like? First, we know that, it must be a chorded keyboard. Let's think about our computer keyboard first. Let's say the nice modern one such as Ergodox Keyboard. Quickly we can conclude that it is inferior to the steno or piano keyboard. Because, if you want to hit multiple keys, huge keys such as piano keys are much better than computer keyboard keys. So, that narrows down to steno vs piano keyboards. I'm thinking, the steno has slight advantage. Because, the layout is logically more simple. And, the way it is layout out, it has dedicated keys for thumb, allowing each thumb to hit multiple keys. And, the other keys can also be hit together by pushing between the rows. However, i think that piano keyboard are highly competitive here, and it's proven usable. Because, a piano keyboard has much more keys, which becomes big advantage when we need large number of distinct outputs. For example, you want the system to input math symbols, Chinese, Braille. For example, you can hop your hand to a different octave to input digits, another octave for math symbols. 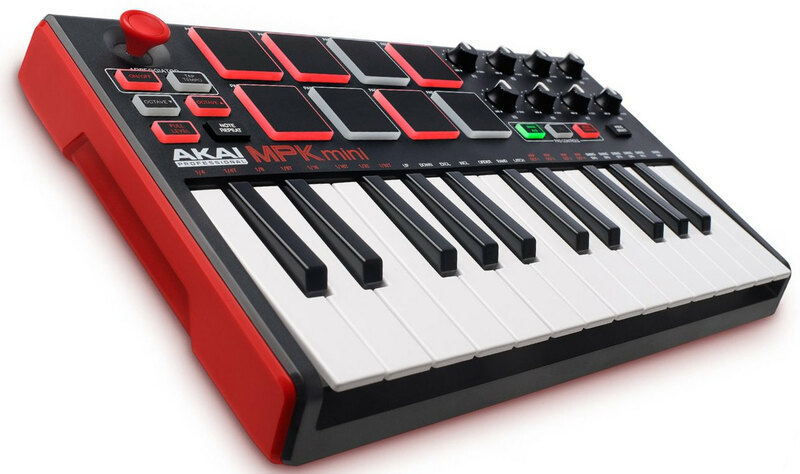 Piano keyboard comes with USB and midi protocol. There are special ones, for composer or Disk Jockeys, having just 1 octave (12 keys) or 2 octaves. The speed increase comes from the short-hand system. The design of this, will probably be based on a modal mode, as in vim, so that one can switch between short-hand input and normal letter input. For example, when you write code, often you have to type functions or “for loop” statements. What if, any function or statement you ever have to type, can be typed by just 3 keys? The completion and function template feature in many IDEs (such as Microsoft Visual Studio) is a example of significant keystroke saving. But it is not ideal. Because, it has a selection process. The popup that you have to visually make a choice. This significantly slow things down. We need to get rid of this. And, the completion system is ad hoc, per language or per project. We want a generic system. Programing language code is quite different from natural language. You won't be able to utilize syllables in natural languages much. Especially, for some programing languages, such as ALP, Wolfram Language, or Haskell, that uses more symbols than English words. So, i think there are 2 interesting exploration here. Design a short-hand system for PC keyboard for programing and for input natural languages. Design a input system using piano keyboard. I think it's relatively easy to design such a system, and be at least 2 times faster than our current of using computer keyboard for coding and writing (yet, not based on the steno system). The hard part is selling it. That is, convince others to use it. Suppose you are god and in a snap of a finger you have the perfect short-hand system for the PC keyboard to type code or natural languages at 300 word per minute. Now, chances are, it will go down in history as wonderful invention that failed to catch on. Unless, the marketing god Steve Jobs is on your side. 2016-05-09 addendum. Actually, there is already a system to type text using piano keyboard. The speed and learnability is comparable to steno, if not better.